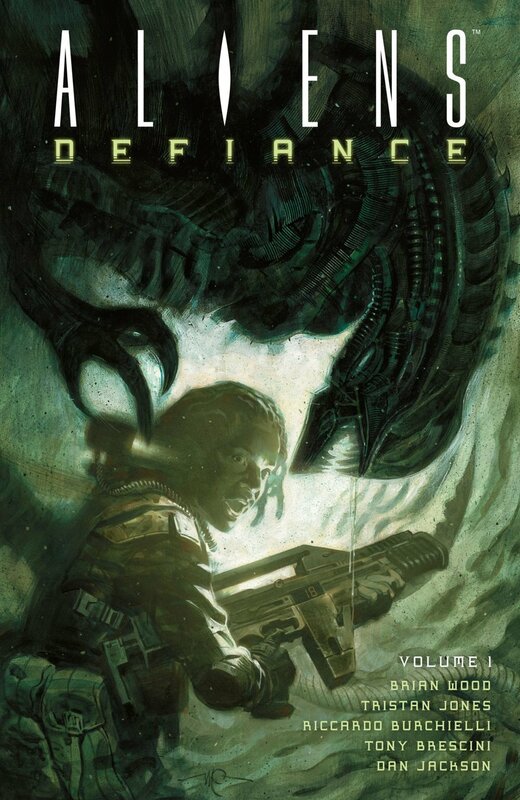 Aliens: Defiance takes an intriguing track in exploring the universe of this popular franchise (and one of my personal favorite franchises, at that). 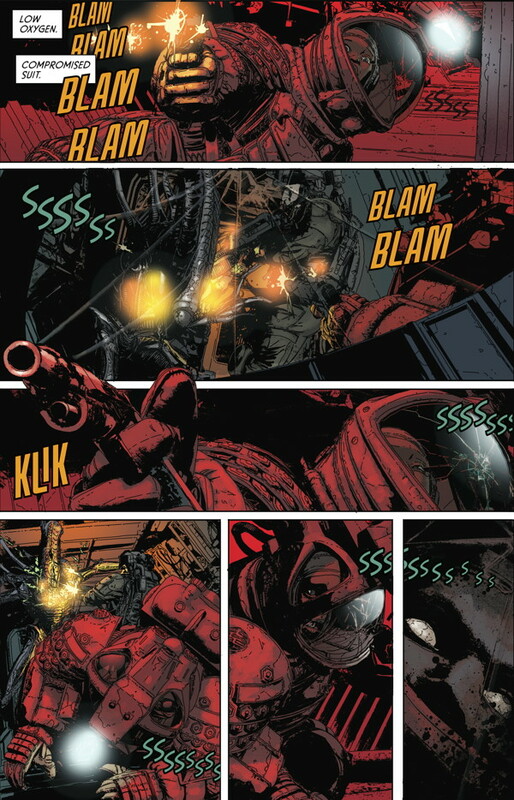 While it involves all the (largely) necessary key ingredients of an Alien story - the Colonial Marines, Weyland-Yutani, synthetics, and, of course, the titular creatures - Brian Wood assembles these elements in some interesting ways. Zula Hendricks is a veteran who suffered a catastrophic spinal injury during her first mission in the marines. She’s a tough heroine, and an intense regimen of physical therapy and a futuristic back brace have made it possible for her to walk again. Although she’s mostly physically rehabilitated, she suffers from post-traumatic stress, her dreams plagued by her battlefield memories. As Defiance opens, Zula has been tasked to join a team of Weyland-Yutani drones on a salvage mission. A derelict freighter has been discovered, its crew MIA. I’ll bet you can guess why. To say that the mission goes awry would be an understatement, and it prompts the synthetic Davis to do some further research into why they were dispatched. Weyland-Yutani knew all about the presence of the aliens on board the freighter, but neglected to inform Davis’s team. In defiance of their marching orders, Davis and Zula go rogue, vowing to stop Weyland-Yutani from acquiring an alien sample to bring back to Earth. Over the course of the six issues, or “episodes” as the title page indicates, collected here Wood explores some psychologically interesting issues. Taken as a whole, it’s fairly light on actual alien mayhem and Wood uses the bugs primarily as an inciting incident to get the ball rolling. The main focus of interest here are Zula and Davis themselves, and what their roles are within this military-industrial complex. Zula and Davis make for interesting counterparts. Both have been programmed in various ways, with Davis obviously being the most extreme example as a synthetic lifeform. Zula has been trained by and given a family in the Colonial Marines. Both she and Davis are acting against every order they’re given, fighting against their natural impulses and honed instincts in service of the higher ideals that mandate their service. Although they come at it from different ends of the spectrum, their ultimate goal is to protect Earth, and Wood challenges them in various ways. As the story develops, both characters are forced to compromise their ideals and morals to fulfill their chosen mission. It’s heady stuff, but Wood smartly stages his scenes, giving us insight into broader themes and the Aliens universe through just a few panels. It’s a smart use of minimal space to provide maximal information and subtext. There’s a striking moment about half-way through when Zula recalls first waking up after her battlefield injuries and the conversation she has with her commanding officer. First, I have to call BS on the likelihood of Zula surviving the attack on her as depicted, but I’ll also be highly generous and suggest that it’s possible her memory of the incident is flawed and colored by trauma. Thematically, though, the scene itself is important in broadcasting Wood’s authorial intent in providing further depth to both Zula and Davis within the context of the world they inhabit. There’s little difference between humans and synthetics in a military-industrial complex such as this - both are simply widgets to be plugged in as needed and disposed of when their usefulness runs out. Given that the Colonial Marines are a branch of the American military, it’s hard not to see the parallels Wood draws to current-day policies toward US veterans and our wounded warriors. It’s also quite a far cry from the gung-ho heroics James Cameron presented in the 1980s with ALIENS. For the bulk of this volume’s six episodes, Tristan Jones is largely responsible for bringing Wood’s scripts to life. He does a fantastic job, presenting detailed panels and nicely defined characters for each of the four episodes he illustrates. For whatever reason, episodes three and four are handled by different draughtsmen, Riccardo Burchielli and Tony Brescini, respectively. Burchielli, unfortunately, delivers pretty substandard work in comparison to the preceding two issues from Jones. He cops out of providing any kind of facial details, giving us mostly ill-defined, featureless blobs that are recognizable as heads but little more, routinely staging long-distance shots of indistinct heads and roughly hewn bodies, or casting the characters deeply in shadow or in silhouette. Brescini comes the closest in maintaining the consistency of the bar set by Jones, and Woods gives a few neat scenes to draw in an otherwise quiet, character-focused issue. Thankfully Jones returns for issues five and six, closing out this first volume in terrific fashion. I really appreciated some of the perspectives Jones brought to the table, particularly a segment in issue one that gives us Zula’s view of the action through the cracked faceplate of her space helmet. Dan Jackson does some marvelous work with the art’s colors, as well. It’s a small thing perhaps, but I really dug the way he colors the interplay of bright light on dark surfaces, occasionally blowing out the highlights when we’re giving a direct view of the lightsource. There’s one image late in the book of an xenomorph stepping into the light shining from an overhead projector that looks absolutely phenomenal, the light and data from the display shining over its glossy black skin. He also chose a really interesting color palette for the eyes of the Davis drones. Between Jones’ blank, pupil-less depiction of their eyes, and Jackson’s coloring, there’s an unsettling aura about these synthetics. These drones are not the Ash, Bishop, or David models of the movies. The Davises look human, but are so clearly artificial in this one specific aspect of their anatomy that it immediately creates a noticeable schism that’s instantly disquieting. While Wood stays true to the usual tropes of an Alien story, he still manages to find a few interesting corners to maneuver his characters into, shading their motives with various degrees of complexity. This first in a two volumes series of trades collecting Wood’s original twelve-issue run maintains a pretty high standard throughout, even if one particular sequence involving Zula’s military history requires an extraordinary suspension of disbelief. Issue six ends this volume on a satisfying note, both thematically and in terms of action and staging, concluding some aspects of the overarching story arc of this half of the story while offering plenty of potential sequences of mayhem in the issues yet to come. Since there’s another six episodes to follow in the next volume, expect a cliffhanger ending that isn’t likely to bode well for anybody involved here!